Derry impressed in the second half but had to settle for a Premier Division draw with Shamrock Rovers. Both sides struggled to create chances in a scrappy first half on a poor Brandywell surface. 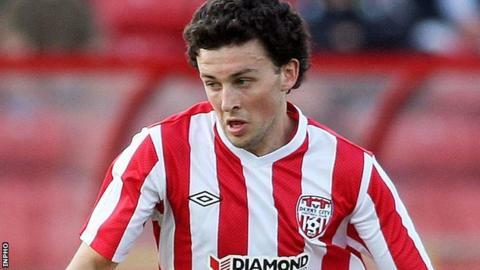 The hosts pressed on the restart and Barry McNamee broke clear, but he was denied by a last-ditch tackle from David O'Connor. Rovers midfielder Keith Fahey was red-carded in the last minute before O'Connor headed over in added time. There was little to entertain the Brandywell faithful in a poor opening 45 minutes. The bumpy pitch and a lack of urgency contributed to a half which witnessed just one incident of note. Patrick McEleney played McNamee through on goal but David Webster's superb tackle prevented the midfielder getting a shot away. Derry picked up the pace at the start of the second with efforts from McEleney and Elding while there were penalty claims for handball in the Rovers box. The Dubliners rarely threatened although Ryan Brennan screwed a shot just wide from Fahey's cross. McNamee was left frustrated again when O'Connor made a timely intervention as he prepared to unleash a shot on goal. Fahey's second yellow card, for simulation, reduced Rovers to 10 men heading into six minutes of added time, but they nearly snatched a last-gasp winner when O'Connor sent his header just over from a free-kick. Derry stay in seventh place while Rovers remain unbeaten but slip down to fourth.